Keep up to date with our announcements by sure to follow us on our Instagram and our Facebook pages! Also, check out our event calendar HERE! 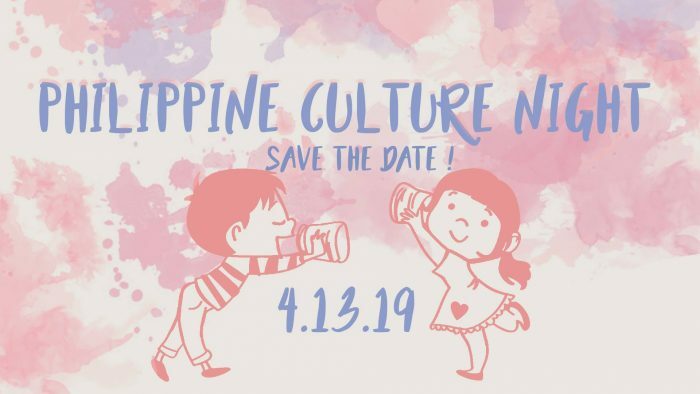 On Saturday, April 13, 2019, FCA will be holding our annual Philippine Culture Night! PCN is a play that is the culmination of everything FCA achieves – it is written, directed, choreographed, acted, danced, and produced by FCA general body members. PCN showcases FCA’s activities throughout the year, which focus on education, advocacy, cultural enlightenment, and the overall promotion of Filipino and Filipino-American culture. The night features both modern and cultural dances, our renowned a cappella ensemble The Mezzopinoys, and a traditional Filipino dinner. In addition, the FAST Bayani Award for 2019 will be presented, which celebrates an individual that has demonstrated exemplary acts to our members throughout their time as part of FCA. See past PCN's from past years here: 2016, 2017, 2018. If you are interested in performing, feel free to sign up! The cultural dance signup sheet is here and the modern dance schedule for this week is here! The mission of the Filipino Cultural Association is to promote awareness and education of Filipino-American culture for the University of Maryland community. We unite our members through cooperative involvement in cultural, academic, political, athletic, and social programs and activities. Through our shared experiences, we preserve, encourage, and inspire the celebration of our culture. FCA is a great way to meet people who you can relate to. As mentioned, we have General Body Meetings every other Thursday at Shoemaker hall, where we learn about our culture and discuss matters that are important to us as Filipino Americans. FCA plays intramural sports, including soccer, football, and basketball. FCA also has social events, which includes the semi-formal dance and other dances. We have both a dance troupe that practices traditional Filipino dances and one that practices modern dance. The dance troupes take requests to perform, and it’s a great way to learn cultural dances as well as perform at special events. FCA also networks with other Filipino organizations in colleges along the East Coast. FCA UMCP is in District 6, which includes DC, MD, and VA colleges. Coming up soon, D6 is hosting its annual semi-formal dance. Buy your tickets soon!